As exclusively announced this evening at the End of Season event the Basingstoke Bison ice hockey team are delighted to confirm that Trane have agreed to remain as �Principal Team Sponsor� for a further season and will once more be known as the �Trane sponsored Basingstoke Bison�. Bison Stats: Cowley 2+0, Jones 0+2, Harding 0+1, Klejna 0+1. Phantoms Stats: Padelek 2+0, Billing 0+1, Buglass 0+1, J Ferrara 0+1. The Peterborough Phantoms came to town to take on the Bison, with both teams separated by only two points, the result could prove very important for the run-in. However, before the game had started, we learnt the news, that Richard Bordowski would not be icing. Although I still believe we have enough depth in this side to compete without him, we certainly would miss his energy, out on the ice, against a very strong Phantoms side. Mr Evans dropped the puck and off we go....... there weren't that many chances in the first couple of minutes, but then Ash Tait (Great news about him re-signing for next season !!) had a couple of chances, but Jordan Marr was able to save them. Then Russ Cowley got a great tip on a pass from Alex Sampford, but again Marr saved the Phantoms from going behind. The first penalty of the game was given to Bison, an Icing Infringement penalty. Basically, it's when a team shoots the puck down the ice, makes a change, but the play's called back on an icing. You get one warning, then do it again and it's a penalty. Paul Petts was the guilty party unfortunately, timed at 10.06. On the powerplay, Phantoms moved the puck around well and the puck came to Petr Stepanek, who unwound a blistering slap-shot, which Alex Mettam just nonchalantly gloved out of the air effortlessly. Then Phantoms took a penalty, when Glenn Billing was called for Interference on Ash, when he was almost through on goal. Penalty timed at 11.56. Both teams returned to full strength soon after. You could tell Tait was right up for it tonight and he had another chance soon after. He picked up the puck, skated in and released a good shot, which Marr had to stretch quite a way for, but he fumbled the puck. Luckily, Marr was quickest to react to loose puck and covered it, just before Ash followed up. We entered the last minute of the first and Phantoms got another penalty. Corey McEwan given a Late Hit call, timed at 19.35. Bison almost snatched the lead right on the buzzer, when they had 3 attempts to bury the puck, but Phantoms defence stood firm. Bison started the 2nd period, with 1.36 left on the powerplay. Adam Jones let rip with a one-time, but Marr devoured the puck into his chest pad. Soon after Michal Klejna set up Alex Sampford, but again Marr was equal to the chance. Phantoms returned to full strength. At 23.29, Hallam Wilson & Nathan Long were in a coming together on the boards. Up went the ref�s arm and penalties were forthcoming. Hallam receiving a Charging call, whilst Long picked up a Late Hit call. Both teams still unable to find a go-ahead goal. Michal Klejna would go closest next, when he managed to get by the last Phantoms d-man and close in on Marr, but he brought down, by a clear trip, but no call came........ frustrating! Then Adam Jones took on the challenge. He pretty much weaved in & out of the whole Phantoms team, before getting off a quite soft shot. Then Phantoms scored the first goal of the game, timed at 32.21. Glenn Billing & James Ferrara (playing in his 600th League game - Congratulations James!) found Ales Padelek over on the far post, he fluffed his first shot and just when you thought the chance had gone, he fired the puck in from the acutest of angles and it somehow found its way past Mettam. At 36.13, Bison's George Norcliffe picked up a Charging call. But a minute on and Phantoms Tom Norton would get a penalty. He was called for Roughing, after he'd thrown a punch at Dr Russ, whilst on the boards. Bison returned to full strength and set about trying get an equaliser. Michal Klejna set up Jones for a shot came on the point, he shot, Cowley got a tip in front and it went past Marr...........now the Bison players (most audibly Klejna, were shouting "That went in, That went in" in Evans direction, but puck appeared at the back behind the goal and the game continued. We entered the final minute of the period. But at the first stoppage after the incident, Klejna was still berating Evans. So, the ref decided to confer with his linesman Cook & Strain. After a few seconds of conferring, Evans pointed to the net and awarded the goal. Obviously, the Phantoms players were not happy about this, neither was Coach Slava Koulikov and he remonstrated with Evans, but it wouldn't change anything now. Apparently, the puck went down into the goal, through the netting and out the back. Goal time was 38.23 and it was a PP goal. Obviously, because of the goal, the clock had to be wound back to when they thought the goal had happened, which they did. So, we entered the final minute again. There was a coming together just by the boards, between Will Weldon and a Bison player. Their momentum carried them into the boards and Weldon stayed down. All the Phantoms guys were screaming for a penalty, but none was forthcoming and Weldon left the ice, with a slight cut. That finished an eventful period and the scoreline now read..... Bison 1 Phantoms 1. Into the 3rd Period we go and it was pretty cagey for first couple of minutes. Then at 43.42, after a Bison foray up front had broken down, Calum Buglass found Padelek, who was way behind Bison lines & he controlled the puck expertly & skated in all alone and buried the puck, top shelf past Mettam. Every time Bison came forward, they found themselves trying to breach a Phantoms defensive line of 3 guys on the line and 2 close behind. A couple of times we did get past, but nothing came of it. Time was running down; 6 minutes became 2 minutes quickly and Bison were still no nearer on finding a game tying goal. We got down to 1.18 left on the clock and Bison managed to secure a face-off in the Phantoms zone. Ash & Tosh used their Time Out. Mettam was placed quite high out of goal, ready to go to the bench when called. But Phantoms won the puck and cleared their zone, so he stayed in place. Klejna picked up the puck, fed Tait, who shot and Marr gave up a juicy rebound, which Cowley jumped on and fired the puck beyond Marr to tie the game. The place erupted!! Goal timed at 59.00. There was still a minute to play, could either team find a late late winner? Although Bison had an opportunity, it wasn't to be. So, at 60 mins, the scoreline read... Bison 2 Phantoms 2. We were going into sudden death overtime! Bison started OT with Tait, Cowley & Jones, whilst McEwan, Susters & R Ferrara lined up for Peterborough. It was a really cagey overtime period, with neither team really wanting to make a mistake and lose the game. So, as the buzzer went for the end, we were going to the dreaded penalty shots, to decide the game. There would be quite a few rounds, so I'll just go down in the pairs of shooters..... & result of penalty. It was a disappointing result, but taking into account we were missing a Top import & also having to re-shuffle the lines around, with just over a minute to go and facing no points, to gain an equaliser and secure a valuable point, I'll take it!! 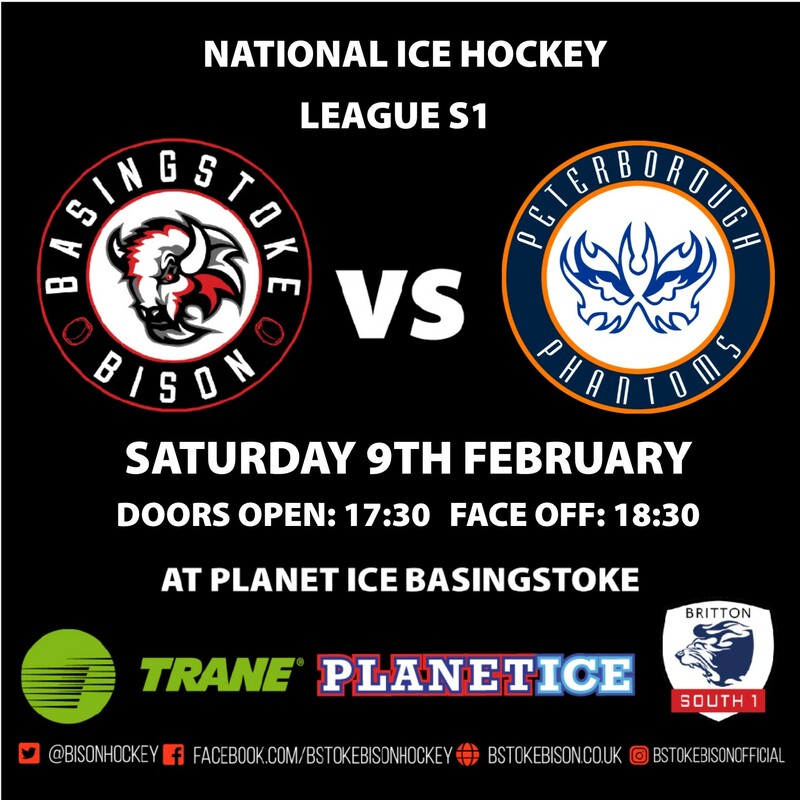 Your Trane Basingstoke Bison travel to Milton Keynes on Sunday, when they face the Thunder.